When I was growing up, and all the way through college and young adulthood, I thought that heaven was free, which it is, and easy to lose; based on behavior, which it is not. Let me give you an example. "The to hell is paved with good intentions." It is assumed and implied that you intentions and behavior can alter your state of grace, or the degree to which you are forgiven you sins. Or, "if you don't change your ways, you will go to hell." A touch more direct. Your behavior can send you to hell, but still wrong. That's not the truth though, and it is not the message Jesus was born and died for. If he wanted you to know you were going to hell, all he had to do was tell you. Instead he showed you love, and tell you the good news, that heaven was free, and available to everyone. (For a better explanation of how he died for you click here.) He wants you in heaven so much, he died for you. Some people think we have to earn our way into heaven, as if we make the first move; as if what YOU could pay the bill for your sin. As if you could compel the Lord into action. As if there was a magic formula. 1 John 4:19 tells us that those people have it wrong. First he loved us. All we have to do is love him. That's it. Love him. But there is still more in this short verse. We LOVE because he first loved us. We learn how to and then we do LOVE, but not just the Lord. You want to love the lord, then you love his people too. 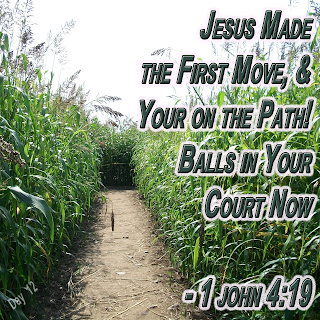 Jesus has already made the first move. He loved you. Balls in your court now!